January 24 is National Peanut Butter Day. I'm also paying homage today to Mr. Peanut. 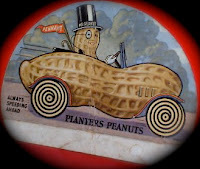 I grew up with Planter's Peanuts. Mr. Peanut, shaking hands with everyone, would walk the boardwalk in Atlantic City! What a treat. I also loved those hot salty peanuts, roasted right onsite. The original company was called Planters Nut and Chocolate Company, so what's not to love? Planters did make peanut butter, but I'm not sure for how long. I've posted lots of recipes for Chocolate and Peanut Butter, but here's an easy Peanut Butter Truffle recipe to celebrate today's holiday! This is a simple recipe for a peanut butter ganache truffle rolled in chopped peanuts adapted from a recipe in CountryLiving. Place chopped chocolate in medium heat-safe bowl. Set aside. In medium saucepan over low heat, cook heavy cream until it just begins to boil; then immediately pour over chocolate. Let sit for 1 minute. Stir until chocolate is melted and mixture is thick and smooth. Stir in smooth peanut butter, vanilla extract, and salt. Pour into shallow baking pan and refrigerate until set, 4 to 6 hours. Spoon chocolate–peanut butter mixture, by tablespoon, into your hand and roll into balls. Place on parchment-lined baking pan and return to refrigerator for 20 to 30 minutes. Place finely chopped peanuts in shallow dish. Roll truffles in peanuts, shaping each ball as you work. Keep refrigerated until serving. What's your favorite Peanut Butter and Chocolate recipe?